I know. It sounds crazy. It is crazy. And it is delicious. Jacques-Imo's Cafe is just down the street from The Camellia Grill, so we drove over around noon in the midst of our too-full-of-omelette-ness. Because obviously eating alligator cheesecake is the appropriating thing to do after eating a five pound omelette with four different kinds of meat. Obviously. Thank the Cajun gods, Jacques-Imo's wasn't open. They're a dinner-only kinda place. 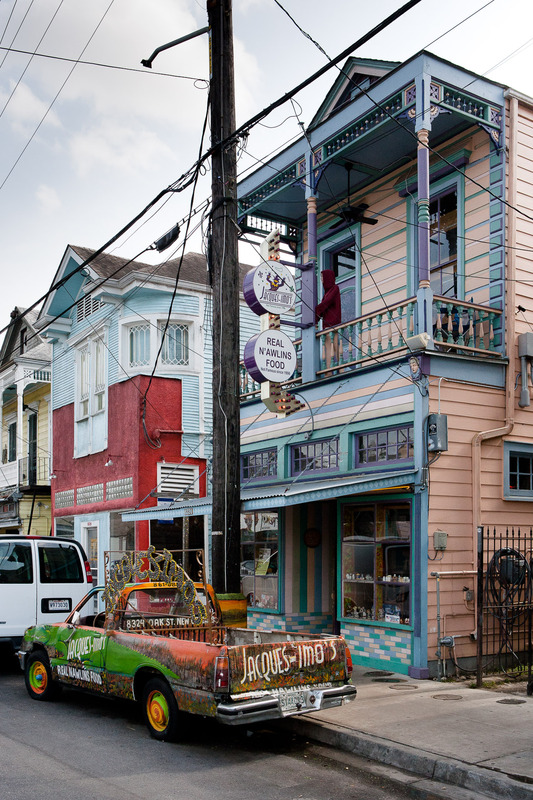 But they're one of the most popular restaurants in New Orleans to find "real Nawlin' food" and tourists and locals gladly wait hours for a table at this quirky, brightly colored establishment. We went back the same evening to get our alligator cheesecake. There was no wait and we were lead from the bar up front, through the kitchen (you gotta love places that nonchalantly give you a quick walk-through tour of their kitchen) to the multi-level dining room in the back. Lights were dim, vivid Creole art hung on the walls and vibe was decidedly "dive-chic". Before we had a chance to open our menus, a waitress brought us two complimentary cornbread muffins with a spiced herb topping. We guiltily gobbled them up as we apologetically ordered the shrimp and alligator sausage cheesecake only. Ten minutes later, our savory cheesecake arrived in all its fatty Cajun glory. The wedge of crustacean, reptile and dairy sat proudly on its plate, surrounded by a creamy gravy of sorts. It tasted more like a quiche than a cheesecake, but was no less delicious. The alligator flavor wasn't completely bizarre or noticeable even; it was our first time trying it…tasted maybe a bit like chicken? Not a dish that will change your life, but a yummy Creole bite at a funky NOLA establishment that should absolutely be on your Nawlins bucket list. Special thanks to Allison (who suggested Alligator Cheesecake. Seriously) for making this blog post possible!